Rapoo was established in 2002 and currently ranks #1 in its home market of China for wireless peripherals that operate on the 2.4 GHz to 5 GHz spectrum. They are trying to expand and take their success globally with their innovative and stylish line of peripherals. 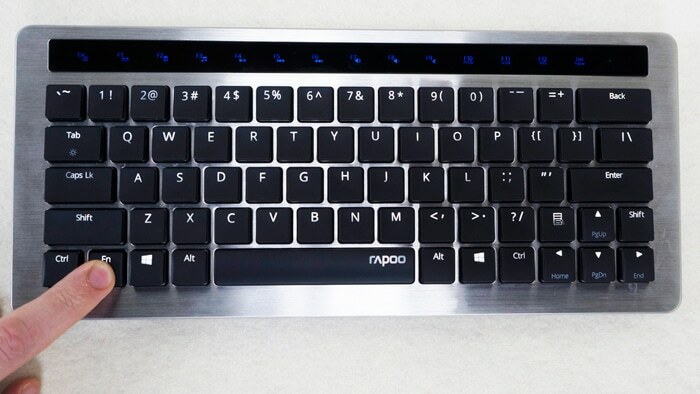 The Rapoo KX is a full mechanical keyboard and does not feature a 10 key. As a result it measures in at a scant 13 x 6 inches and fits perfectly in your laptop bag, making it the ideal mobile wireless mechanical keyboard. Special thanks to Rapoo for having us review the KX mechanical keyboard. 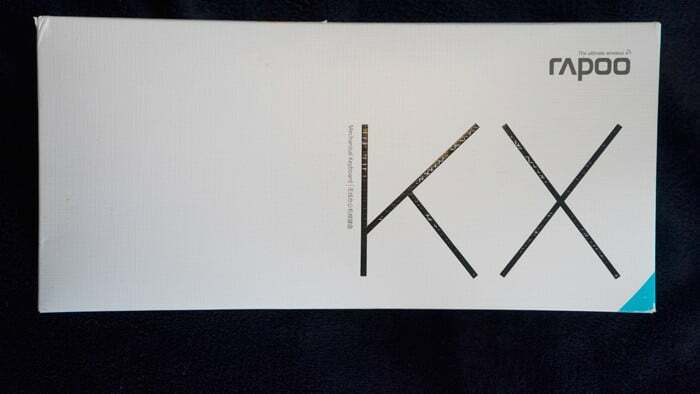 Rapoo went with an interesting packaging for the KX Mechanical Keyboard and that is not a bad thing. The outer sleeve that covers the traditional brown cardboard is made of an off-white pressed thick paper material that has an elegant weave pattern that is clearly visible giving it a textured feel that is shown below. The front of the Rapoo box is a bit unorthodox but that is part of its charm and grabs your attention. As mentioned before and shown in the picture above the front is off-white with an elegant and interesting weave pattern. 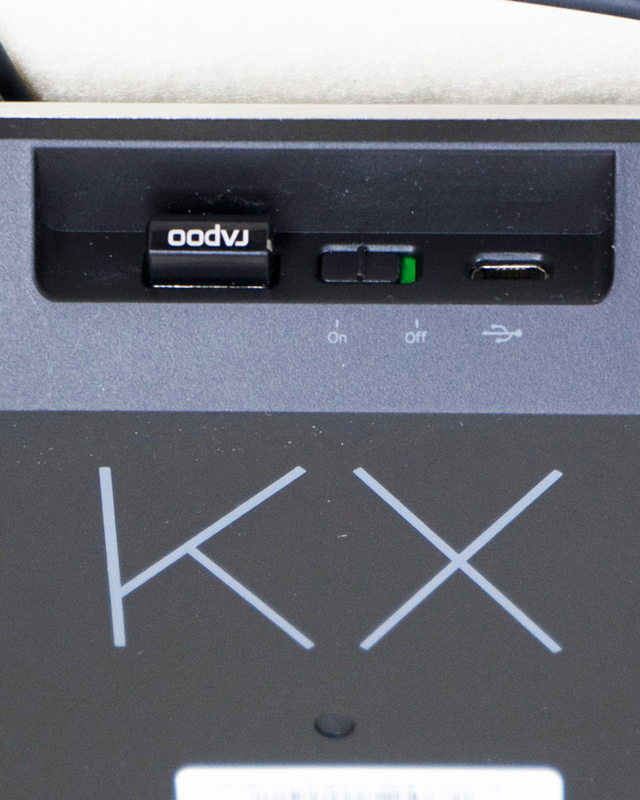 Keeping things minimal, there is “Mechanical Keyboard” in small letters and a giant “KX “on the front of the box in addition to the Rapoo Logo. The textured weave on the packaging has caused an interesting effect where on any printed parts that are raised, the ink seems to have rubbed off from shipping, which adds to the distinct look of the front. Because of these attributes, if this were sitting on the shelf of the local fry’s or micro center, it would stand out and draw you to it and make you want to pick it up. The side of the packaging features a list of operating systems that are supported, a Rapoo authenticity sticker, a two-year warranty label and a disclaimer on the wireless range and battery life. On the other side you find things are much more simple and clean-looking with the Rapoo logo and Mechanical keyboard KX printed on it. However when you get to the back of the packaging, it comes alive with a product picture that shows the mechanical switches and the backlighting with a very interesting photo effect shining brightly. 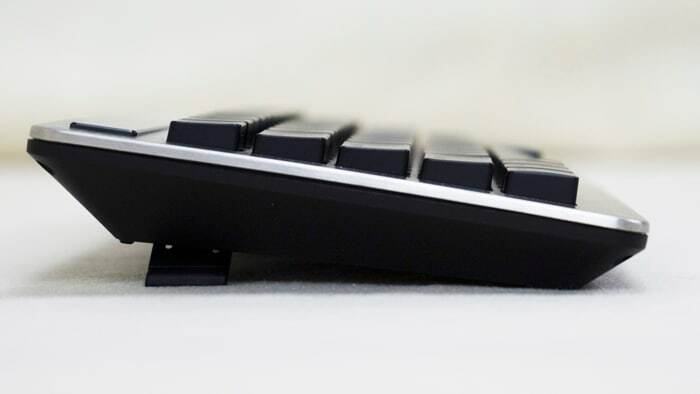 On the left side you find a list of features that include the mechanical keys, tactile feedback vibration of the f-keys, adjustable backlighting and how this keyboard has a built-in Li-ion battery. 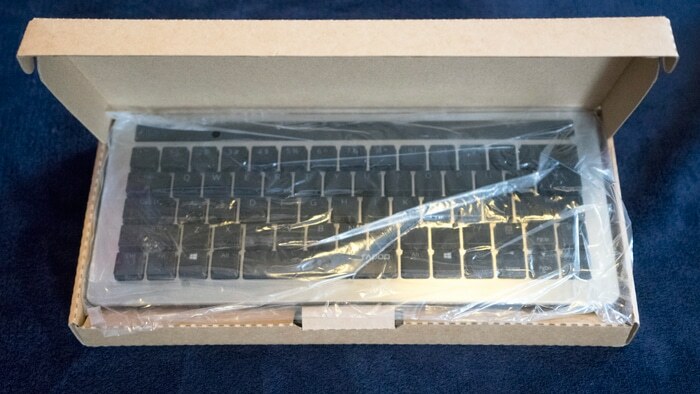 Upon opening the white sleeve you find a traditional brown box with the mechanical keyboard wrapped in protective plastic, USB cable and a Quick-start guide. When I first removed the KX Mechanical Keyboard from its protective covering, I was overwhelmed by the craftsmanship that Rapoo put into the KX. The top is covered in a thick piece of brushed aluminum with block black keys that recess into the aluminum. You can also get the Rapoo with white, red, yellow or blue keys. On the top you will find touch sensitive f-keys/media keys. The bottom of the KX is black and has a rubberized feel and texture to it and two flip down feet that have rubber pads to prevent the keyboard from moving. I had to apply a reasonable amount of force before it would slide on the glass and wood surfaces I tested it on. Also in the middle you find in GIANT letters KX, along with other details about the dual-mode mechanical keyboard. 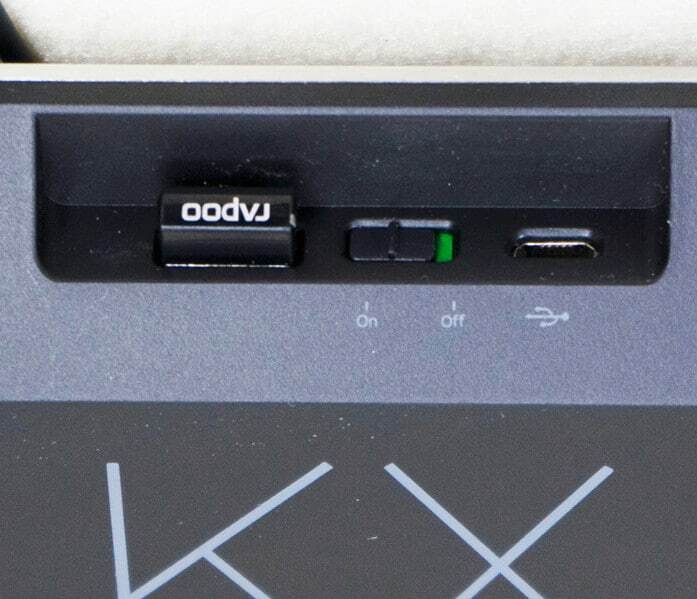 Also near the top you can see the wireless adaptor in its slot, on-off and the USB symbol. Also on the back tilting of the keyboard we get a better look at the Rapoo 5G wireless nano-reciever in its storage slot. Next to it is the power switch currently in the on as indicated by the green, when switched to off it shows as red. Directly next to the power is the micro-USB port that is used to recharge the internal battery. In addition to this you can connect the Rapoo and use it as a wired keyboard. The Rapoo KX comes with a simple software package to ensure full functionality of the Mechanical Keyboard and the F/media keys. According to the information the software works with Windows XP, Vista, 7, 8 and 8.1. During my testing on Windows 7 and 8.1, the keyboard worked as it should and I experimented with the software customization that allows you to configure F1 to F9. The programmable F-keys were actually very interesting because I expected them to replace the media keys when programmed which are accessed through Fn and the F-key assigned to it but instead it reprogrammed the F-key. The software package also seems like general software for a wide range of Rapoo devices. I mention this because you should let it automatically set the model number in the software. If you click on product model number it shows a wide range of devices and the options will change to that device. The software also appears to be paired to the USB wireless adaptor. I was unable to access the software without the USB wireless adaptor plugged in even when using the keyboard wired. 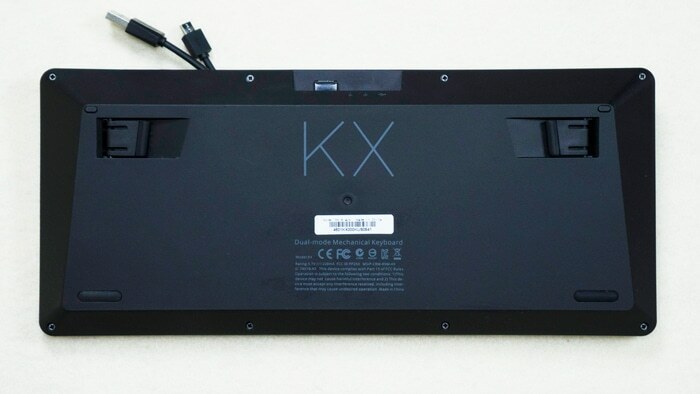 Another interesting note is that in one of the product photos it shows the KX being used on a Macbook Pro and I also found it for sale on MacMall so I would assume that some or all the keyboard functions work with Apple operating systems but I could not test this. As with any wireless product, power bank or anything with a battery, you should always plug it in and let it charge; I plugged it in overnight. Testing the Rapoo was interesting to say the least. I started out testing it on my desktop system and within a day I went back to my other mechanical keyboard. However I took it with me to use with my laptop and the keyboard found its niche and excelled and I couldn’t ask for a better wireless mechanical keyboard for on the go. Also on a full charge I averaged about a week of normal use even with having the keys backlit. The keyboard has 3 lighting profiles and these are off, low and high. I found the low setting was more than bright enough for working in low light conditions. I played with the high setting briefly but found it too bright for using in the dark. I found it was effecting my low light vision and I was wanting to turn up the screen brightness on the laptop, but it is nice if you need it. Also the lighting was fairly even across the keyboard and if I had to guess, I would say each switch has its own dedicated LED. The top function keys are touch and vibrate when you touch them to provide feedback. The backlighting on these keys is always on and in standard mode they are illuminated in white light. The exception to this is when you press the Fn key to access the Media keys. When the Fn key is held down, this row of keys lighting changes to blue to indicate that the media keys are active. In addition to this I found that the KX intelligently conserves battery life by turning off the backlighting after one minute of inactivity. I suspect that it also turns off the keyboard automatically after extended periods of inactivity, but I could not find any information confirming this. The keyboard does feature dual-mode so if the battery goes dead, you can switch from wireless to wired. 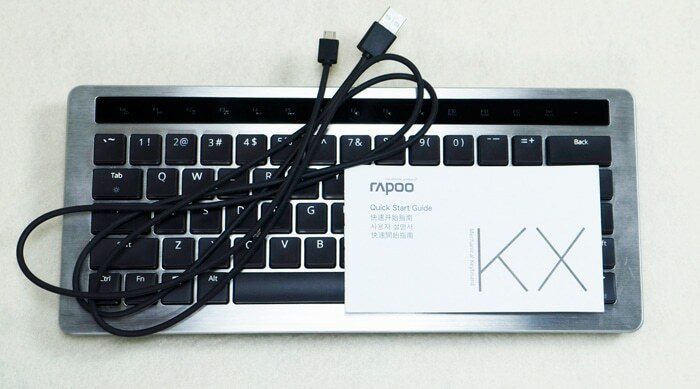 The mechanical switches that Rapoo use on the KX are Yellow Switches designed by Rapoo. I would say the feel is somewhere between Cherry MX Red and MX Black Switches. After using this keyboard, I found the switches had a very nice linear depression that was also extremely smooth but yet had a wonderful tactile feel. There was a very subtle clicking noise that was soft enough not to draw attention when you’re sitting in a coffee shop . I did manage to use the KX to play some less intensive games using the WSAD keys. However if you’re playing a game where you like to have tons of macros programmed to specific keys then the KX lacks ability to do this. However considering what the KX is designed to do and the features it has, this is not a detriment. Its primary role is as a mobile Mechanical Keyboard and this is something that it does extremely well. Once I discovered the Rapoo KX’s niche for being the ideal keyboard to carry with you and your laptop and experienced its capability and features in this role, I was rather impressed. The fit and finish of this keyboard was top-notch and lives up to Rapoo’s exquisite craftsmanship claim. 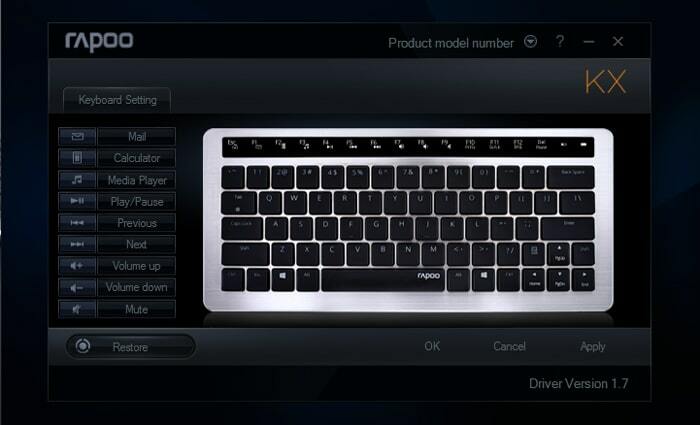 Also with the different key color options, Rapoo allows users to tailor the KX to suit their individual tastes. The battery life I found was above average considering this is a wireless keyboard that is a mechanical keyboard with full backlighting. The Lithium Ion battery that Rapoo used along with the switches and hardware allowed this keyboard to give a week of wireless use through intelligent power saving features like auto shut off on the led lighting that turns back on the instant you hit a key. I was also very pleased with the tactile feel of the mechanical switches and enjoyed their quietness in the environments in which I used them. As a touch of flare the USB cable that is included also featured Rapoo in depressed lettering. There were minor issues though with the performance that came up during gaming like it missing rapid keystrokes on the same key, but if you are buying this for gaming then you’re not buying it for the right reason. Its niche is as a road warrior and in that it excels and judging by how it is constructed, I would say it will last you years of enjoyable use. While using it in a coffee shop, I had several people complement on its looks and ask who made it and other questions. I think if I could improve something about the KX I would say I would have liked to see it have Bluetooth connectivity. So many laptops have Bluetooth built-in and that would avoid having to use a wireless adaptor. I also feel this could open up an additional market place for the Rapoo KX because it could be possible to make an app to allow you to use it with Android and Apple tablets. 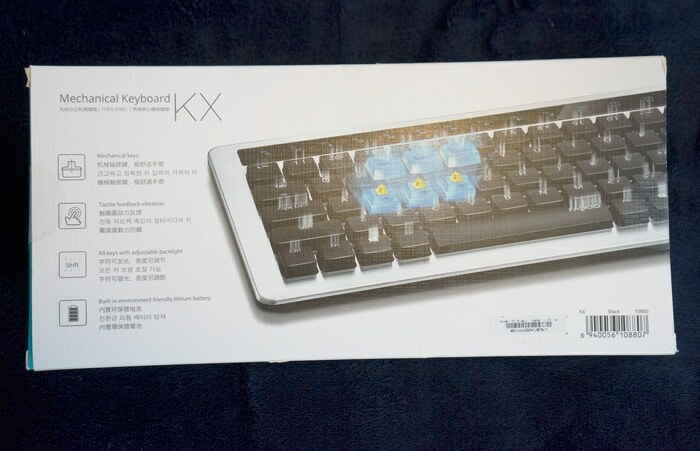 I found the Rapoo KX online for under $60 and considering the impression that the KX left on me, I would advise anyone who is looking for a great keyboard that is not only wireless, but also features mechanical keys and backlighting with a limited amount of programmability, that it is a must have. Next GIGABYTE X99 SLI Review, Excellence On A Budget! The Rapoo KX is a nice small keyboard that works great when you are on the go and still want a mechanical keyboard.